Ships today if ordered in the next 9 hours and 37 minutes! Monitor the health of your saltwater reef aquarium with the Reef Professional Kit for Alkalinity (dKH), Calcium, Phosphorus (ULR phosphate), and pH. Water quality is the most important aspect of a healthy reef aquarium. Remove subjective results and guesswork by confidently testing with Hanna Instruments. Bridge the gap between simple chemical test kits and expensive instrumentation with this convenient, professional kit. The HI772 Checker®HC (Handheld Colorimeter) provides a simple, accurate, and cost-effective way to measure alkalinity in degrees of carbonate hardness, commonly abbreviated as dKH. Critical to marine environments, alkalinity not only provides the carbonate ion concentration required for skeletal formation and growth of many coral, but also acts as a pH buffer against large changes in acidity.. 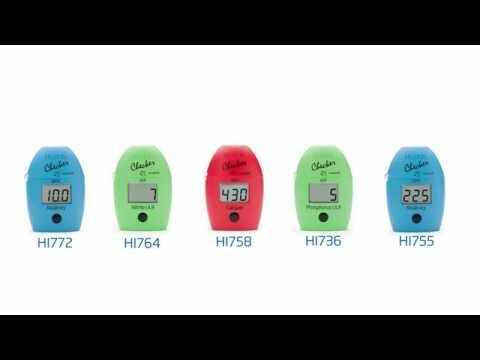 The HI758 Checker® HC (Handheld Colorimeter) provides a straightforward way to measure calcium. Required for the development of calcium carbonate skeletons of coral reefs, calcium is a crucial component of marine waters. Accurately testing calcium levels is critical for everyone from coral reef hobbyists to aquaculture farms and research facilities. Updated to include the HI73119p mechanical pipette for better accuracy! The HI736 Checker® HC (Handheld Colorimeter) is a cost-effective way to measure phosphorus (orthophosphate as phosphorus) in marine systems, including reef tanks. Testing for orthophosphates is standard practice for saltwater aquariums and provides valuable insight into your reef tank’s water chemistry to help ensure long-term coral health. Phosphorus is an important parameter to measure in aquaculture and aquariums; levels that are too high can lead to extensive algae growth and prevent coral calcification and growth. The HI98107 pHep® helps you accurately measure your saltwater aquarium's pH level to make sure it stays between the acceptable range. When pH is not properly monitored, corals and other marine organisms can be at risk. pH levels in an aquarium that are too low or too high – or levels that fluctuate too often – can put stress on marine life. The HI98107 pHep can be calibrated to two points, which is recommended for improved accuracy. It is important to use buffers that bracket the expected value of the sample to be tested. In most reef tanks, the expected value is often pH 8, the meter should be calibrated using pH 7.01 and pH 10.01 buffers. The HI70436m Deionized Water is intended for cleaning cuvettes and for use with the HI758 Calcium Checker® HC. The Calcium Checker requires deionized water with very low electrical conductivity (TDS) levels. Using DI water with elevated EC values at C1 stage in the HI758 will cause false high readings. Proper storage of your electrode will ensure reliable measurements and a long electrode life. Our HI70300M Electrode Storage Solution is specially formulated to keep the pH glass hydrated while minimizing organic growth. A reef aquarium often has a pH value of approximately 8. For improved accuracy when using your HI98107 pHep waterproof pH/temperature meter, it is recommended to calibrate in two buffers. It is important to use buffers that bracket the expected value of the sample to be tested. For example, if the expected value is pH 8, the meter should be calibrated using pH 7.01 and pH 10.01 buffers. HI770710P is a set of premium quality pH 7.01 and 10.01 calibration buffer solutions. Each sachet has the lot number and expiration date stamped on it and is made of light block foil ensuring freshness each time one is opened. The HI736-25 are the replacement reagents for the HI736 Phosphorus Ultra Low Range Checker® HC. These high-quality reagents are manufactured in our state-of-the-art facility and are clearly marked with the lot number and expiration date on each packet for traceability.